Which cereal was introduced by members of The Grateful Dead? 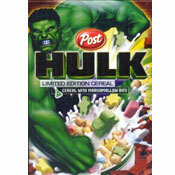 This cereal has been described on the box as a "lightly sweetened whole grain wheat cereal with natural and artificial flavor." It's Malt-O-Meal's bargain imitation version of Kellogg's Vanilla Creme Frosted Mini-Wheats. Like many other Malt-O-Meal cereals, the package for this cereal often showed the kangaroo characters of Cool Blue and Lil' Oaty. 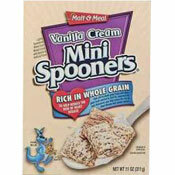 What do you think of Vanilla Cream Mini Spooners?